The dental pulp (dental nerve, pulp tissue) is located inside the pulp chamber and root canals, inside the internal third of the tooth. Generally, the front teeth have a single root canal, while molars often have three or more canals. During root canal treatment, the infected pulp is removed and the contaminated canal system is debrided, cleaned and disinfected. Finally, the canal system is obturated. The root canal therapy helps to avoid apical surgery or extraction of a tooth, as well as to retain the tooth in its natural form and position. Following endodontic therapy, care should be taken to avoid chewing or biting with the treated tooth until the treatment has been completed to prevent the breaking or cracking of the tooth before it has been fully restored. 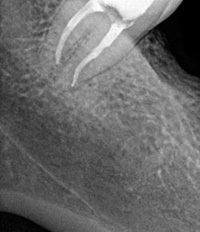 After the root canal therapy, the tooth has to be reconstructed. The commonly recommended restorations vary, depending on the dental condition of the treated tooth. Usually, carbon dental posts are used to anchor the filling material, to increase the height of the internal core of the tooth and to reinforce the destructed tooth crown. 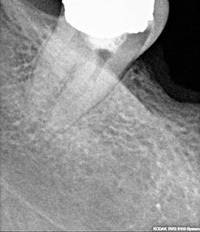 Sometimes, a porcelain dental crown is indicated to improve the appearance, strength and stability of the treated tooth. 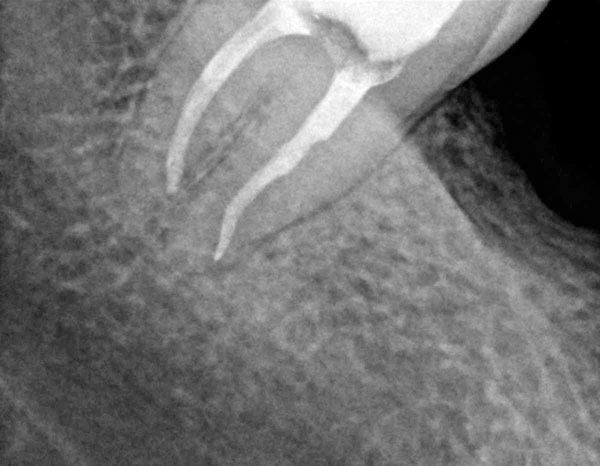 If the root canal treatment is not performed, the inflammation extends to the adjacent bone and tissues beyond the root tip and leads to the formation of periapical abscess, periapical granuloma, phoenix abscess or root cyst formation.